Comparing the phyiscal universe to our internal universe. Why is it characters cannot see their own problems? Simple logic suggests that if a character knew the source of his or her own troubles they would employ the necessary solution and move on. Countless narratives, it would seem then, thrive on a character’s lack of awareness. They have the motivation. They have the moxie. They do everything they can to overcome their personal trouble, but still they continue to fail. Do they all simply lack the intelligence necessary to succeed? No. They suffer because they continuously look in the wrong place. Like the universe we inhabit, our minds exhibit a natural curvature in context of spatiality. Packed with neural networks hosting years and years of justifications built upon justifications, our minds tend to warp our perception of problems and how best to solve them. Narratives provide us an opportunity to step outside of this system and appreciate the truth. 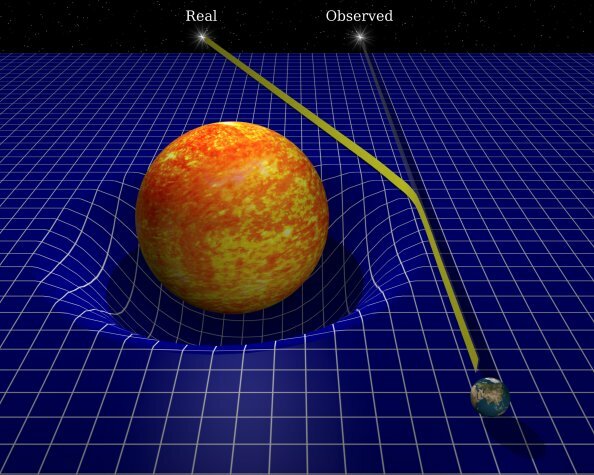 Dense and heavy objects like the Sun cause large amounts of curvature in space. 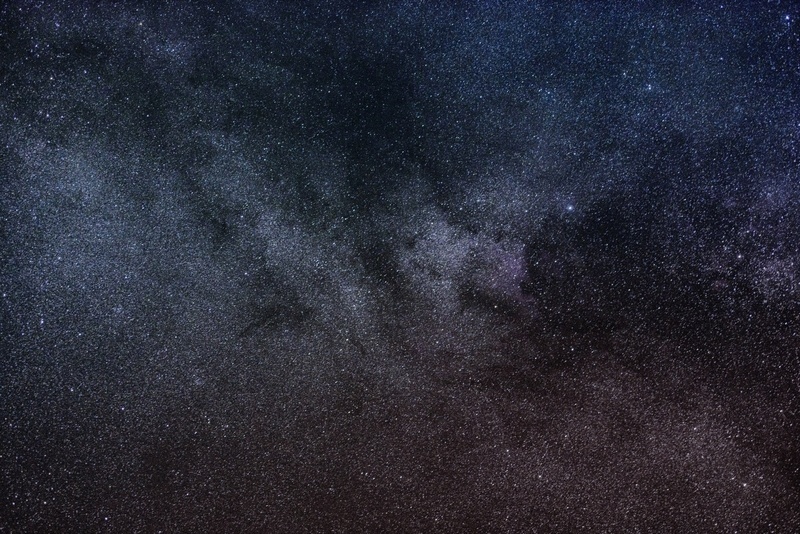 Insert a large-enough mass into the equation and starlight itself bends. In the above diagram, an observer on Earth perceives the star to be in one place, when in reality its true location lies far far away. The same happens within the human mind, and by extension, the mind of a story. Replace the hot blazing sphere of plasma and magnetic fields with the weight of inequity born of justification and suddenly internal perceptions warp and bend. If only I could control my cravings for chocolate more, then I would lose all this weight, or If only I could block out all the temptations this world provided, then I could stay faithful to my spouse. Warped starlight prevents the people hampered by these thoughts from truly moving on, from resolving their issues and extinguishing that internal Sun forever. Perhaps the person troubled by chocolate suffers from some emptiness inside, some deep emotional issue they have avoided for far too long. The treat fills that hole, but only temporarily. It seems like the right response, but really only acts as a panacea. Same with the person struck with the pangs of wanton deceit and betrayal. They may have spent years suffering under the delusion that they actually cared for this other person when in reality, their love was a lie. In both cases, the appreciation of the true star’s location reveals a solution. Pursue that childhood issue with therapy and without hesitation. Doubt feelings that were never there and let loose the bonds of conscience. The problem concerns the size of that Sun and whether or not the observer gains greater perspective. In Star Wars, Luke focuses so much of his time and energy on how long he’ll have to do things (stay on Tatooine, Jedi training) that he completely misses the real source of his troubles: his constant need to test himself (for more, see this video exploration of Luke’s character arc). In A Separation, Nader (Peyman Moadi) concentrates so much of his energy on proving his own innocence that he completely fails to see the effect his actions have on his 11-year old daughter, Termeh (Sarina Farhadi). Both of these stories—like all effective narrative—offer their respective Main Characters the opportunity to see the true “light” of trouble in their lives. This revelation, or unmasking of the central character’s blind spot, speaks to the purpose of story. Lining up their final decision to solve this problem or not with the eventual consequences of their choice helps lay the foundation for the story’s central argument. Change and character growth thus, becomes an important part of better understanding the universe of story (see Change Your Character Doesn’t Need). In Star Wars, Luke learns to trust in something external effectively negating any problems he had with testing himself internally. He recognized what was really going on and took advantage. The blinding explosion and shiny medal provided after only affirmed the rightness of his decision. In A Separation, Nader received no award. A man so driven to assign blame could only end up in a dark and unresolved place. The solution radiated so clearly in the worried eyes of his daughter, yet went unnoticed at the hands of his personal mission and obsession. Isolated and alone in the chaotic courtroom halls of Iran, Nader could only sit and wait for a decision that had one result: tragedy. We have only our minds to appreciate the meaning of story. For a story to truly be effective then it must honor the mind’s problem-solving process. It must provide the appropriate “Sun” of justification for its characters and warp their perceptions of what is truly needed to resolve the issues in their lives. Dramatica makes the distinction between the two “stars” with its concepts of Problem and Symptom. The Symptom (whether it be the Main Character Symptom, Overall Story Symptom, Influence Character Symptom or Relationship Story Symptom) appears to be the source of trouble. The real source, however, lies in the actual Problem of the appropriate Throughline.